Rheumatoid arthritis (RA) is a chronic inflammatory immune mediated disorder where synovial proliferation, pannus formation and bone erosions are histological hallmarks . Proinflammatory cytokines play a major role in development of disease and clinical progression. Anti-cytokine therapy has brought a major impact in RA management . Clinical assessment of RA patients includes history, physical examination, scores of disease activity and questionnaires addressing quality of life. As far as imaging is concerned, conventional radiograms and magnetic resonance imaging (MRI) are well-recognized support methods for clinical assessment and response to therapy. They have intrinsic problems, nevertheless. Radiograms cannot evaluate joint inflammation and show low sensitivity for damage; MRI, although sensitive, is expensive and not widely available [1, 2]. In recent years, high-resolution musculoskeletal ultrasound (MSUS) has been increasingly used in rheumatological practice worldwide . While MSUS gray-scale (GS) usually identifies synovial proliferation, power Doppler (pD) may recognize active inflammation and neoangiogenesis. Both parameters seem worthy of utilization in the follow-up of RA patients . In addition, MSUS is also reliable for the detection of bone erosions  as well as for the detection of subclinical synovitis and prediction of disease relapse and structural progression . Although unequivocally useful in RA, MSUS has intrinsic reproducibility issues that may be optimized through standardized training and recommendations. In 2010, a multinational group of 25 Rheumatologists from the American Continent participated in a consensus-based questionnaire and established the first recommendations and guidelines for MSUS course training in the Americas . Besides, EULAR consensual advice for use of imaging techniques (MSUS included) in the management of RA has been recently proposed . In this paper, we review the correlation of MSUS findings with synovial tissue inflammation in RA patients and its implications for a better clinical utilization of this imaging technique. Also, we discuss MSUS clinical application as compared to classical activity parameters. Lastly, we update MSUS techniques and interobserver reliability in RA. Comparison of MSUS findings with features of synovial tissue allows characterizing how far this technique can capture the inflammatory activity that is actually ongoing inside joints. Andersen et al. studied the correlation between histological synovitis and GS and pD in RA patients and found fairly good correlations between pD and histological features of inflammation and proliferation, namely synovium expression of CD3, CD68, Ki67 and von Willebrand factor (r between 0,44 and 0,57). There were areas of histological inflammation where no pD could be identified . Other authors showed that 5 RA patients in DAS remission who had GS but negative pD had low likelihood of relapse after TNF inhibitor tapering and histologically had low infiltrates of macrophages (CD68+), T (CD3+) a B (CD20+) cells . In a study of 14 RA patients in remission who were submitted to surgery, 15 synovial samples were collected. GS changes were found in 80% patients, pD detected in 60% of the individuals and MRI synovitis in 86%. Histologically, 4 samples had severe inflammation, 6 moderate, 3 mild and 2 minimal . In another study in 20 patients with knee arthritis, pD showed better correlation with histological synovitis than contrast-enhanced MRI . In the setting of rheumatoid synovium, the thickness of synovial lining and the number of vessels are increased, although it is not clear whether the angiogenesis is a cause or a consequence of the inflammatory process [13, 14]. Koski et al. found that in RA synovium there was a good correlation between the number of vessels and the inflammatory state (synovium inflammatory infiltrate), but not with pD. They concluded that chronic histological synovitis was not always related with a positive pD  In fact, in another study by the same authors, pD was not always translating synovial inflammation and could be related with other pathologic processes, such as fibrosis . Waltheret al found a correlation between the number of vessels and pD, but did not report on the inflammatory state . In healthy synovial joints, the presence of pD signal associated with serum levels of vascular endothelial growth factor (VEGF), but not with other growth factors or cytokines. This could support a role of VEGF in neo-angiogenesis in RA . In a survey of 55 RA patients in clinical remission, pD correlated with VEGF levels and other angiogenesis markers . On the contrary, a correlation between pD and serum vascular endothelium growth factor could not be established in RA patients according to a 2004 study . 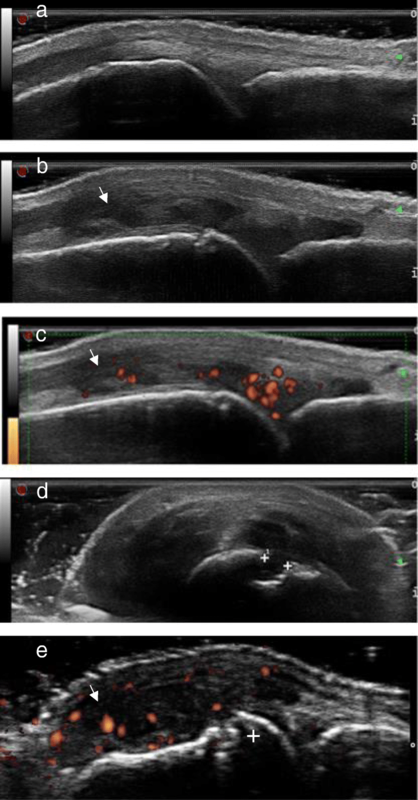 Contrast-enhanced Doppler ultrasound may be superior to pD in translating a dynamic process such as synovitis in RA, in which perfusion may be determinant, but little is known about the correlation of these findings with histological features in the synovium RA. This method has proved to be superior to pD in defining active synovitis, using arthroscopy, but not MRI, as the gold standard [21–24]. Worthy of note, synovial production of IL-6 was found to associate with synovitis as detected by MRI and pD . This in accordance with our own results, depicting that IL-6, but not other cytokines, correlated positively with DAS28, swollen joint count, 10-joint pD score and GS/pD of both wrists. In multiple linear regression, the association of IL-6 with 10-joint pD score was maintained even after adjustment for DAS28. There was no correlation of IL-6 with tender joint count, 10-joint GS score, or bone erosion . Interestingly, Ball et al. described association of serum IL-6 with arthritis on physical examination and pD score in patients with systemic lupus erythematosus . Overall, these findings [26, 27] may result from a prominent synovial production of IL-6. In fact, IL-6 stimulates angiogenesis , and this could eventually explain the association of IL-6 concentrations with a positive pD in RA. A recent report accounted for association of serum IL-6 with MSUS parameters of synovitis in patients with early RA; of importance, serial measurements of IL-6 were linked to structural damage . In patients with established RA, a correlation of serum IL-17 with synovial hypertrophy and pD in hand MSUS was documented . Interestingly, the presence of Th-17 lymphocytes in synovial tissue was associated with a persistent pD signal, according to a 2010 study . As seen, the study of the relationship of MSUS parameters with synovial tissue features is clearly a field open to research, which may add new pathogenic information and help to clarify MSUS usefulness in RA management. For many years, Rheumatologists have been using the disease activity score of 28 joints (DAS28) and other composite scores as gold standard for assessment of RA activity; these tools have clearly brought great progress in treatment monitoring. Even though they are the most extensively validated methods for measuring disease activity to date , the precise way of objectively defining inflammation is still lacking. MSUS can be worthwhile in this context, since it is more sensitive than physical examination for detection of arthritis according to a number of studies [33–37]. In patients with joint inflammatory symptoms lasting less than 12 months, MSUS significantly increased the classification of patients as RA (31% pretest, 61% post-test) . In individuals with established RA, synovial hypertrophy and pD scores of wrists and MCP correlated significantly with physician-recorded clinical outcomes and helped the rheumatologist in clinical decision . Of great importance, preliminary data indicated that the MSUS methodology improved the accuracy of the 2010 ACR/EULAR criteria for identifying patients needing methotrexate treatment. GS ≥ 2 and pD ≥ 1 were good indicators of synovitis . According to a study published in 2001, pD scan of MCP joints was a reliable method in assessment of synovitis of RA patients, considering MRI as standard . In a systematic review and metanalyis of 21 studies, MSUS was more effective than conventional radiograms for detection of bone erosions; efficacy was comparable to MRI and reproducibility was good . In another systematic review, MSUS added value to clinical findings for the diagnosis of RA when studying at least MCP, wrist and MTP joints; to evaluate remission, scanning of at least wrist and MCP joints of the dominant side was advocated. In both circumstances, pD was a more reliable instrument as compared to GS . Recent data suggested that both MSUS and clinical examination were relevant to appraise risk of subsequent structural damage in RA patients . Subclinical joint inflammation detected by imaging techniques as MSUS probably accounts for the paradoxical structural deterioration seen in RA patients allegedly in clinical remission . Of note, Peluso et al. demonstrated that remission as confirmed by pD was much more prevalent in patients with early than long-standing RA . We have previously reported that pD, GS and bone erosion on MSUS were associated with swollen joint count, but not with joint tenderness . Concordance of physical examinationand MSUS assessment seems poor (not more than 50% between the most affected joint and pD signal), and RA structural progression has been more associated with swollen joint count than with pain [48–50]. Correlations studies of MSUS with disease activity are a matter of debate. In a study employing pD score of 22 joints and GS score of 28 joints, a defined correlation of MSUS parameters with classical measures of RA activity (acute phase proteins, DAS28) was found. Differently, correlation of MSUS scores with health assessment questionnaires were weak to moderate . In a 2014 study, concordance level of standard activity measures with MSUS was evaluated. For such, a pD score of hands, radiocarpal and MTP joints was utilized. Discrepancies between pD and DAS28 occurred in 29% of cases, promoting changes in therapeutic decision, in other words, supporting DMARD escalation in patients with continuing subclinical synovitis and preventing escalation in symptomatic patients without ultrasonographic synovitis . Likewise, Gartner et al. demonstrated pD signal in up to 20% of patients in remission according to DAS28 . Recently, it has been shown that the 7-joint GS/pD Backhaus score showed performance comparable to clinical and laboratory data in RA patients under various therapies. Higher score predicted bone erosions after one year. Of interest, Backhaus method was sensitive enough to demonstrate decline in bone erosions in patients who switched biological agents . In patients in remission, a link of GS/pD positivity with risk of clinical flare and structural progression was demonstrated by metanalysis in 2014 . A 2012 study revealed that the presence of pD signal was an accurate predictor of flare in RA patients in remission . Synovitis detected by pD may predict biologic therapy tapering failure in RA patients in sustained remission, according to a very recent report . Adding of pD was able to identify RA patients in DAS28 remission, with subclinically active disease. The same authors reported that the combination of clinical and pD parameters recognized patients in remission who could undergo anti-TNF dose tapering . It has been observed that subclinical synovitis is long-lasting in RA patients in clinical remission . In a study dated from 2012, pD, but not low-field MRI, predicted relapse and radiographic progression in RA patients with low levels of disease activity . In early RA patients on conventional therapy, pD-positive synovial hypertrophy identified ongoing inflammation, even during remission and also predicted a short-term relapse . In an observational study of 307 RA patients, Zufferey et al. demonstrated that many subjects in clinical remission according to classical parameters (DAS28 and ACR/EULAR criteria) showed residual synovitis on GS and pD scan . Yoshimi et al. documented synovitis by pD in patients in clinical inactivity and suggested that the pD parameter is essential to confirm “true remission” of RA . Recently, a group of authors originally approached the correlation of MSUS with clinical scores in RA patients with and without fibromyalgia. While GS scores correlated with classical parameters in both groups, the pD analysis was more precise by correlating with clinical scores only in patients without fibromyalgia . In 68 RA patients evaluated with a six-joint pD method (two MCP, wrists, knees), the global MSUS score correlated moderately with the DAS28; in this survey, pD positivity was a sensitive-to-change method for monitoring the short-term response to anti-TNF agents . In a cross-sectional study of 97 RA patients, an inactive disease status defined by a 12-joint pD score (but not clinical parameters) associated, interestingly, with decrease in complement levels in patients treated with biologics . In 2015, the ARTIC trial addressed the question if MSUS could correlate with DAS28 defined RA remission criteria. In 238 patients with early RA randomized to perform or not GS/pD MSUS in addition to DAS28, both strategies (MSUS included or not) were effective to estimate remission after two years of therapy . In summary, there has been plenty of recent literature looking at the role of MSUS either as a complement to physical examination or as a measure of disease activity. It seems the discrepancies between US findings and clinical findings on articular examination are more important in long standing RA and/or fibromyalgia associated RA patients, where metrics are less reliable (due to difficulties in physical examinations and on pain exacerbation). It remains an open question if MSUS would work as additional or preferential criteria for assessing RA activity. MSUS looks a promising instrument for monitoring RA disease activity, but a greater body of evidence still is required. Another critical aspect when using MSUS in the evaluation of RA is reproductibility. Inter-reader analysis of the clinical assessment of joint inflammation can itself show some discrepancy [68, 69]. Intra and interobserver discrepancies in both acquisition of image and image interpretation have been a matter of concern. A study dated from 2007 reported that the interobserver agreement of a 3-dimensional pD scan was better (> 0.80) than a 2-dimensional quantitative pD method . In healthy subjects, MSUS of MCP joints using an 18 MHz transducer yielded an excellent interobserver kappa (0.83) for erosions . A fair to good concordance (kappa 0.36–0.76) of a semiquantitative MCP score for cartilage damage was described in RA patients in 2010 . Subclinical joint changes in asymptomatic feet of RA patients were recently assessed. Concordance between MSUS and radiograms was low (kappa 0.08–0.40). Inter-reader agreement was excellent for bone erosion (kappa = 1), good for quantitative synovitis (0.64) and moderate (0.47) for pD signal .In 2011, the interobserver reliability of a synovitis MSUS resulted in moderate concordance (kappa 0.50) for quantification of synovitis in the radiocarpal joint . The Swiss Sonography in Arthritis and Rheumatism (SONAR) group had previously developed a consistent MSUS method for assessing RA activity utilizing B-mode and pD scores . The same group evaluated synovitis and erosion in six differentMSUS machines. Overall, agreement was not more than moderate. Considering only high-quality machines, kappa concordance was better for synovitis (0.64) than erosion (0.41) . Yet in 2005, the EULAR promoted the “Train the trainers” course aiming to evaluate MSUS interobserver reliability in RA. Clinically dominant joint regions (shoulder, knee, ankle/toe, wrist/finger) were examined. Concordance was particularly high for bone lesions, bursitis, and tendon tears (kappa = 1). As a whole, interobserver concordance, sensitivities, and specificities were comparable with MRI . The reliability of the Backhaus 7-joint score was evaluated in 2012 and the best interobserver concordance was obtained for bone erosions in second MTP (plantar side), with kappa of 1. Agreement for pD in palmar side of wrist was good (0.79). Intraobserver reliability of the method was moderate to substantial . In our own experience, we have been employing a 10-joint score exclusively of hand/wrist joints (dorsal aspects of wrists and second and third MCP, and volar aspect of second and third PIP joints of both hands). After evaluating 1380 joints of 60 RA patients, kappa agreement for synovitis ranged from fair to good (0.30–0.70); for cartilage changes, also from fair to good (0.28–0.63; for pD signal, from moderate to absolute agreement (0.53–1); and for erosions, from good to excellent (0.70–0.97) . In 2014, the LUMINA European study assessed the reliability of grading MSUS videoclips with hand pathology in RA by employing non-sophisticated internet tools. Intra-reader concordance for GS/pD synovitis was moderate to good (0.52/0.62), while the interobserver agreement for global synovitis (synovitis and tenosynovitis) was not more than moderate (0.45) . Also recently, a short collegiate consensus attempted to improve MSUS interobserver reliability. Concordance was good for B mode synovitis (0.75) and excellent for pD (0.88). Kappa values were excelllent for small hand joints, but poor to fair in wrists, elbows, ankles and MTP. Admittedly, the consensus meeting was useful to improve agreement in synovits scores of still images. Moreover, the consensus strongly emphasized the need for standards of image acquisition and interpretation . The several studies [68–82] evaluating reliability of MSUS scores have revealed some variation. As a whole, MSUS seems very reliable for bone erosions (kappa ranging from good to excellent); in turn, the grade of agreement for synovitis, although generally moderate to good, has shown more fluctuation. Standardized training seems essential to improve all these outcomes. A high-resolution machine with a linear high-frequency probe (7.5–18 MHz) should be utilized for evaluation of small joints. In the most widely used scoring systems, semiquantitative GS, generated in the B-mode, synovial proliferation is classified as: zero (absent); 1) mild (slight hipoechoic or anechoic image in articular capsule); 2) moderate (presence of elevation of articular capsule); 3) severe or marked (important distension of articular capsule). The semiquantitative scale of pD signal stratifies inflammatory activity and angiogenesis as follows: zero (absent); 1) mild (one pD signal); 2) moderate (two or more pD signal, meaning < 50% of intraarticular flow); 3) severe or marked (> 50% of intraarticular flow) . In addition, Carotti et al. reported that the resistive index (RI), using spectral Doppler, quantified inflammation in microvessels of finger joints and wrists and discriminated RA synovitis (higher values) from normal subjects . Bone erosions, in turn, are defined according to the OMERACT criteria and are classified as present or absent . Figure 1 illustrates MSUS findings in normal and RA hand joints. There has been no agreement regarding which joints and tendons should be systematically examined in MSUS of RA patients. A number of different methods and scores have been advocated, without wide concordance to date. As a whole, it was proposed to include dorsal and volar exam of the hands in daily practice and clinical trials , but volar examination might not be consensual. Historically, MSUS scores were firstly proposed in 2005 by two groups of authors [83, 86]. Scheel et al. described different MCP and PIP scores for GS and pD . In 2006, Loeuille et al. reported a 7-joint GS/pD score including wrist, MCP and MTP of dominant side . One year later, an 8-joint system evaluating GS/pD of MCP and MTP of dominant side was proposed by Hensch et al. . In 2008, Iagnocco et al. designed a 10-joint method including MCP, PIP, wrist and knee including tenosynovitis, bursitis and erosion in addition to GS/pD . Also in 2008, a 12-joint simplified MSUS including elbow, wrist, MCP, knee and ankle was reported by Naredo . The 7-joint MSUS score proposed by Backaus et al. in 2009 has been the most largely utilized in recent literature and includes five hand and two foot joints of the clinically dominant side: wrist, second and third MCP and proximal interphalangeal (PIP), and second and fifth metatarsophalangeal (MTP) joints. This score also evaluated tenosynovitis and erosive changes . In 2010, Hammer et al. proposed a 78-joint GS/pD score . In 2012, a 6-joint MSUS score of wrists, MCP and knees utilized synovial effusion in conjunction with the synovial proliferation and pD parameters. This score was practical, trustworthy and sensitive-to-change for evaluating synovial inflammation in RA . Of note, a semi-quantitative 10-joint score of synovial thickness and pD which included only MCP joints was proved a reliable endpoint in a clinical trial . A modified 7-joint score adding dorsal and palmar recesses of the wrists, as well as of small joints of hands and feet, was described in 2014. In a survey of 32 patients with early RA (832 joints examined), GS and pD were sensitive to detect synovitis . A total pD score of 8-joint (bilateral wrist, knee, and the second and third MCP joints), reported in 2015, was found to be a simple and effective tool for monitoring RA activity . Also very recently, a 12-joint score evaluating synovial hypertrophy by B-mode technology and synovitis by pD signal was described. The wrist–hand–ankle–MTP assessments were able to predict unstable remission in RA patients presumably inactive on methotrexate therapy . With such heterogeneity in the previously mentioned scores, it is important to verify if scores with low number of joints correlate well with scores involving more joints, in order to find a set feasible for clinical daily practice. For instance, the 7-joint Backaus score significantly correlated with a 12-joint instrument for monitoring of response to infliximab in RA patients, according to a 2016 study . A novel GS/pD score composed of a bilateral approach of six hand joints (first, second and third MCP joints, second and third PIP joints and radiocarpal joint), two feet joints (second and third MTP) and, in addition, one tendon (extensor carpi ulnaris), performed better than previous scores in a longitudinal analysis . Using a data-driven approach, the same group of authors set out to validate a new MSUS score in a large survey of early or established RA. The set comprising GS/pD scores of seven joints/two tendons (first and second MCP, second MCP, third PIP, radiocarpal, elbow, first and second MTP, tibialis posterior tendon, extensor carpi ulnaris tendon) preserved most of the information when compared to a 9-joint score (which added fifth MCP and fifth MTP) . A systematic review of 14 studies published in 2011 did not yield a consensus as to the minimal number of joints to be included in a global MSUS score . Newer recommendations after critical analysis of the most recent MSUS scores are expected. Table 1 lists, in chronological order, the MSUS scores described so far. MSUS is an useful instrument to complement the physical examination of RA patients. The method is quick and safe. The GS/pD scales are helpful to detect early synovitis and MSUS is also sensitive in the identification of bone erosions. The method is of interest to identify subclinical disease activity in patients considered to be in clinical remission and might add relevant information regarding response to therapy. Whether targeted therapy to pD activity would provide superior outcomes compared with treating to clinical targets alone, it is still a matter of open discussion, which was recently highlighted by the Targeted Ultrasound Initiative group . Proper clinical trials are warranted to clarify this point. Correlation of MSUS parameters with synovial tissue inflammatory activity and cytokines is also an area to be searched. Exploring this field may disclose new physiopathological features of synovitis and also better clarify the meaning of MSUS parameters. Importantly, MSUS is practical, feasible and less expensive than MRI. Quality of MSUS devices is surely an item of major importance. Better training and competency of sonographers, allied to incorporation of modern ultrasound will certainly improve MSUS performance in the following years . For the time being, a number of points regarding employment of MSUS in rheumatological daily practice demand elucidation. Validity and reproducibility of MSUS scores have still to be improved (interobserver concordance is yet variable – just like clinical assessment). Choice of equipment and selection of parameters to be utilized (pD alone, pD plus GS, bone erosions, cartilage changes, synovial effusion, tenosynovitis, spectral Doppler) are also pending issues. Since a pD signal can be also seen in healthy joints , the adding of spectral Doppler and estimate of RI might provide useful information regarding the flow in synovial membrane (low RI are seen in inflammed joints) . New data on reliability of RI as a measure of synovial flow and microvessel inflammation should be available shortly. Above all, MSUS score standardization, considering the particularities of each affected joint or tendon, is surely a requirement. Solved these questions, MSUS will consolidate its role as a reliable instrument to complement physical examination, appraise disease activity and monitor response to therapy in RA management. MSUS can be nowadays considered a complement to physical exam in patients with rheumatoid arthritis (RA). MSUS seems to correlate well with indexes of disease activity in RA patients. Subclinical synovitis seen on MSUS could help the physician in clinical decisions. Standardization of MSUS techniques is necessary to consolidate the method in clinical practice. AP, HS, JPP, IGS, JAM, MCB and JEF carried out literature search and reviewed the articles. AP and HS wrote the manuscript. JPP, IGS, JAM, MCB and JEF reviewed the manuscript and made adjustments to the text and contributed to update the review. All authors read and approved the final manuscript. JAM is currently the chief of the “Image in Rheumatology” Committee of the Brazilian Society of Rheumatology. AP and IGS teach rheumatology fellows on the use of ultrasound in Rheumatology.